The general affidavit forms are to ensure that the statement you are making is completely legal and verified by a notary. It could be a form where you legally certify about attaining transferred asset or about the correction of information on the title application of your vehicle. These forms are many and varied including Affidavit Forms for marriage, sponsored students, small estate, domicile, residence, name change, birth and so on. All such forms will have a notary as a witness. 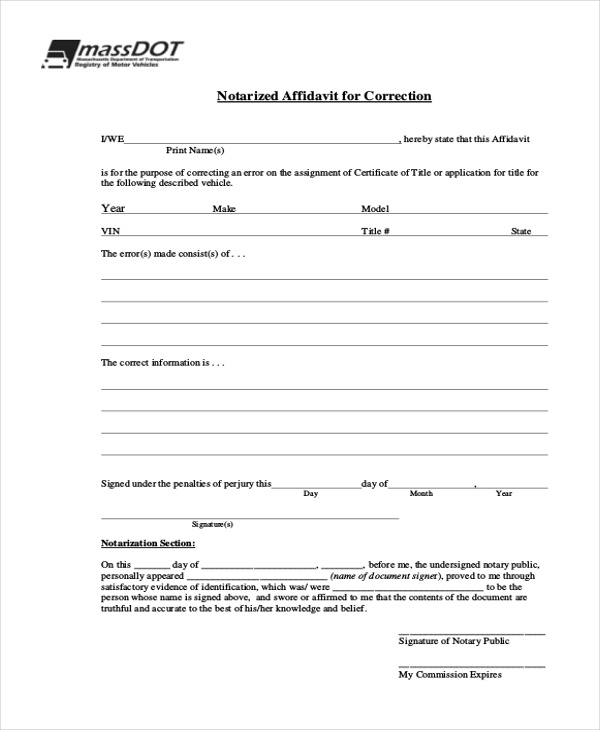 If you are looking for general affidavit forms that will help you to declare the correction of a mistake in a previous title application, this form here would be handy for you. The form comes with 2 separate paragraphs on the incorrect as well as the correct information. Below the form, there is a designated section to be filled by the notary. 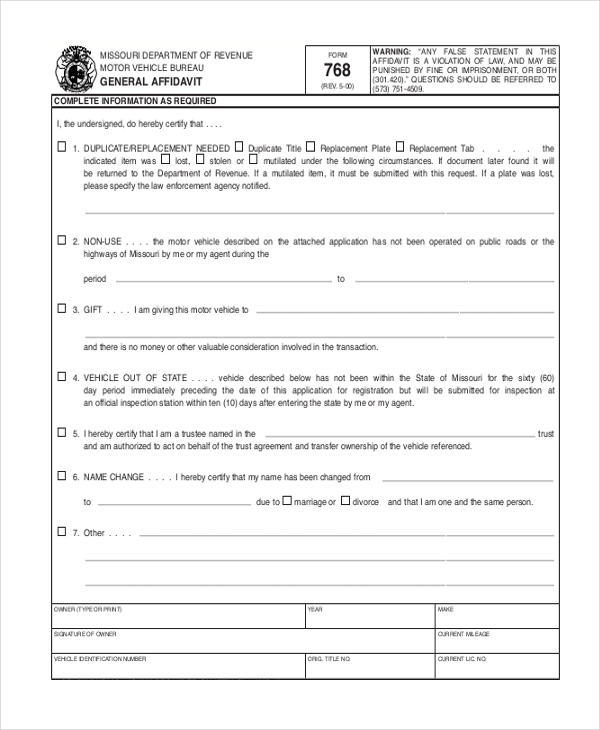 This affidavit form will help a motor vehicle organization when somebody is requesting for a duplicate title or replacement tab or replacement plate of a vehicle. The form will help the vehicle’s trustee to note about the use or non-use of the vehicle in a certain situation, any person of the trustee wishes to offer the vehicle as a gift etc. 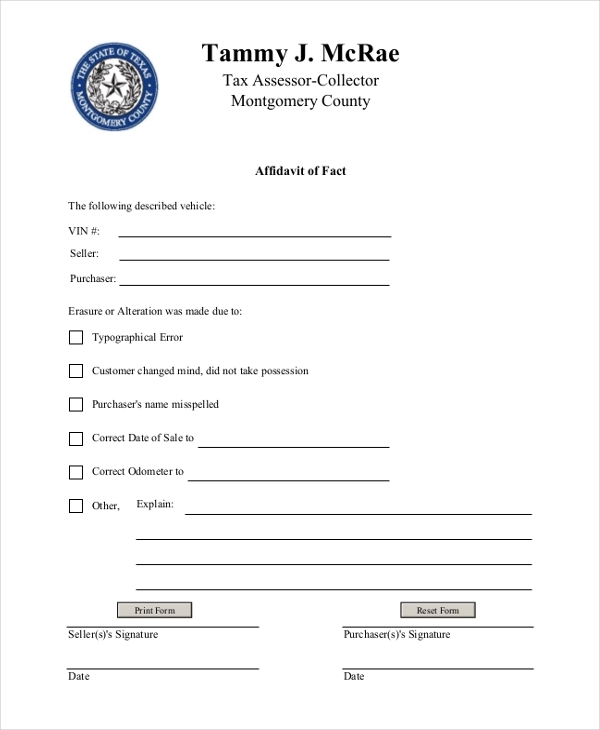 This affidavit form would be needed by tax assessor-collectors when there has been a change in a deal concerning a vehicle. The form starts with the VIN of the vehicle, the names of the seller and purchaser. Then, there is a list of conditions that explain the alteration or erasure of the deal. 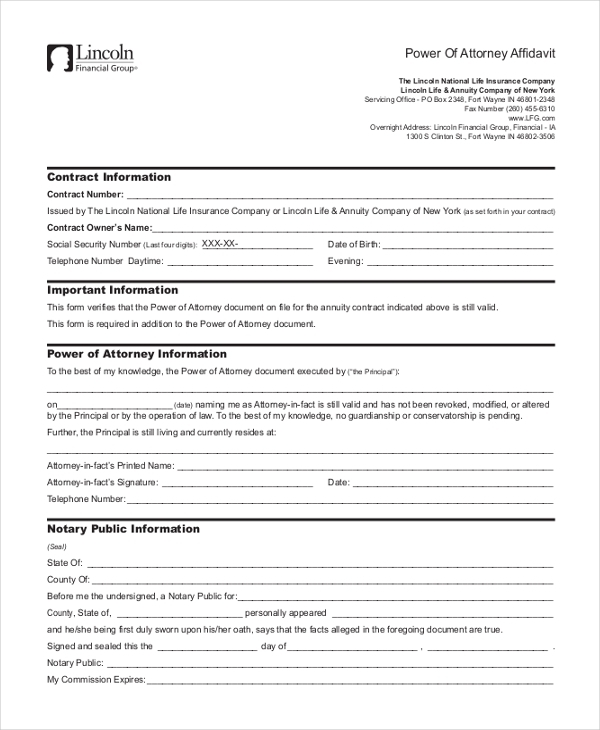 This attorney general affidavit form would be required by the insurance companies when they have to verify the POA document for annuity contract made before is still valid. The form is to be filled by the POA declaring that no conservatorship or guardianship is pending. The section below is to be filled by the notary. 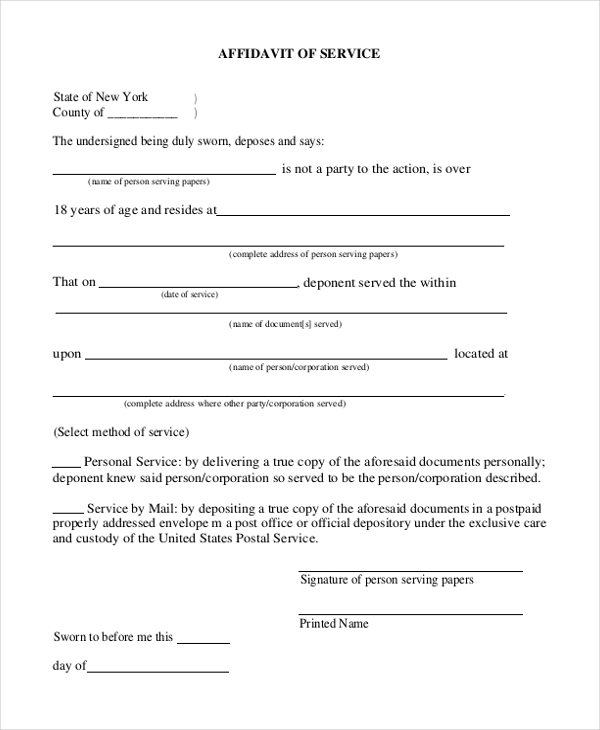 You have a neat and professional affidavit of service form which is to be completed by a person serving papers. The form contains an official and legally enforceable declaration that the undersigned is not a party to the action. The document will also allow him to mention the date and name of the paper being served. 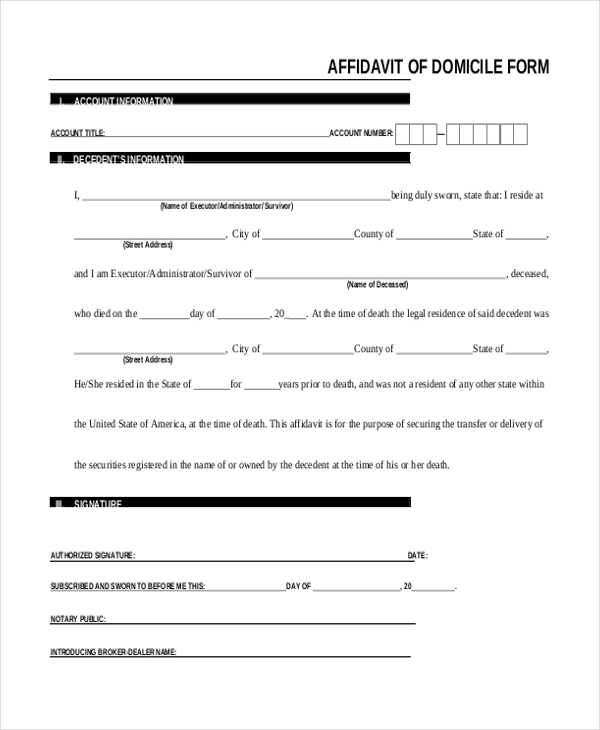 This witness affidavit form is meant to secure delivery or transfer of securities registered in the name of a deceased to his survivor. Here, the survivor clearly mentions that he is the survivor of the deceased person and also forwards basic information on the death of the late individual. Below, there is a section for the notary who stands as the witness of this declaration. This property transfer affidavit form is to be completed by the new owner to whom the property has been transferred to. The form comes with all the major relevant sections including pointers on the property, type of transfer, whether the property was purchased from a financial institution, the exemptions, and certifications. 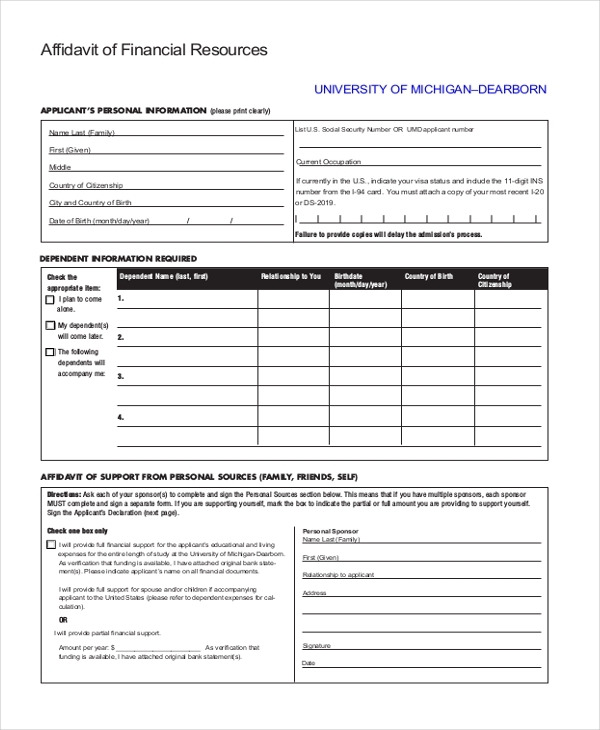 Your university would need this form when you have to gather information regarding fund resources of international students in your institution. The student would have to mention his personal information, dependent information as well as information about the sponsors willing to sponsor his education abroad. He can mention both about personal and funding agency sponsors. This form would be handy for academic institutions that are admitting sponsored students. The form has to be filled up by the sponsor where he will officially declare about his promise to sponsor the student and would also mention the sum committed for sponsorship. The scholarship number of the student should be mentioned as well. 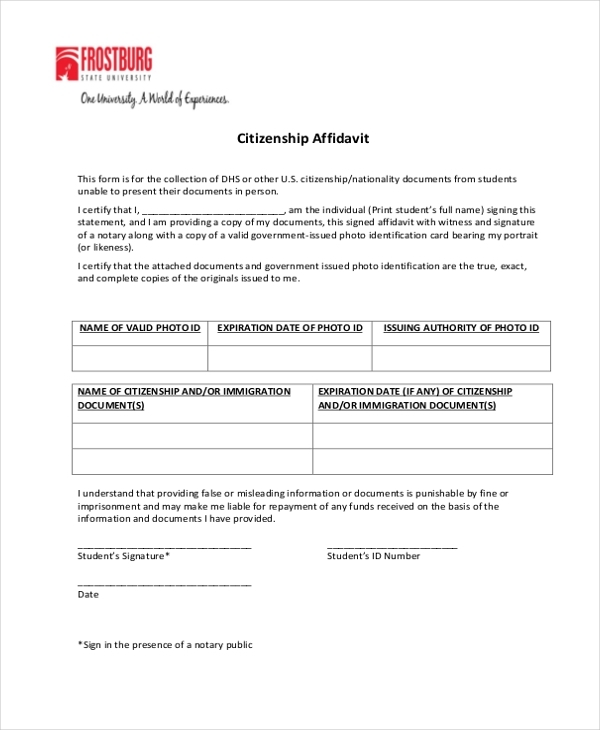 The form here would be a cool aid for your university when you have to confirm the citizenship proof of your students. When those students are being unable to submit the proof documents in-person. 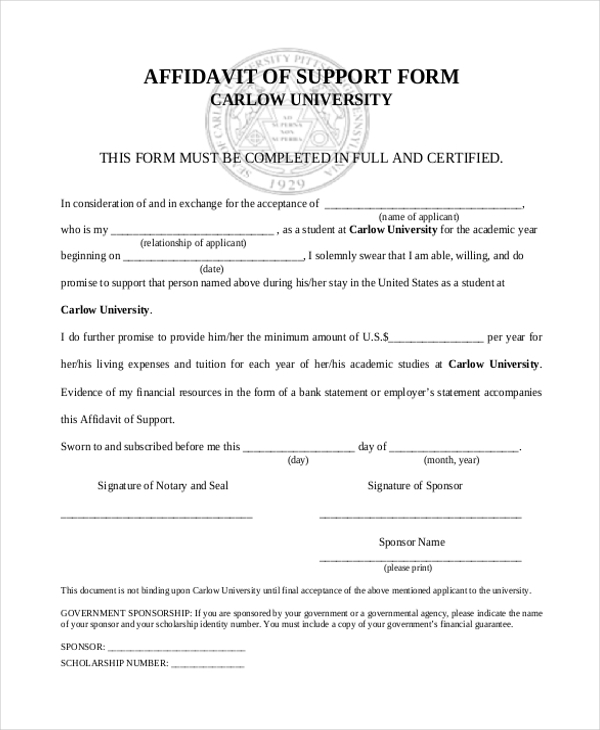 The document contains a declaration by the student that the certificates or papers that the student is sending with the form are valid and accurate. What is The Purpose of General Affidavit Forms? Who Needs General Affidavit Forms? The general affidavit forms are mostly needed by lawyers, notary, and courts as it’s before them. The affidavit forms are signed by the applicants. Besides, the tax assessors they also require to keep these forms to legalize an alteration of a deal. Then, the educational organizations would need the general affidavit forms as well while admitting the sponsored students in their setting. It could mean personal sponsorship or sponsorship by any organization. Apart from all these, the insurance companies require the affidavit forms when a client declares that a previous contract is still valid. 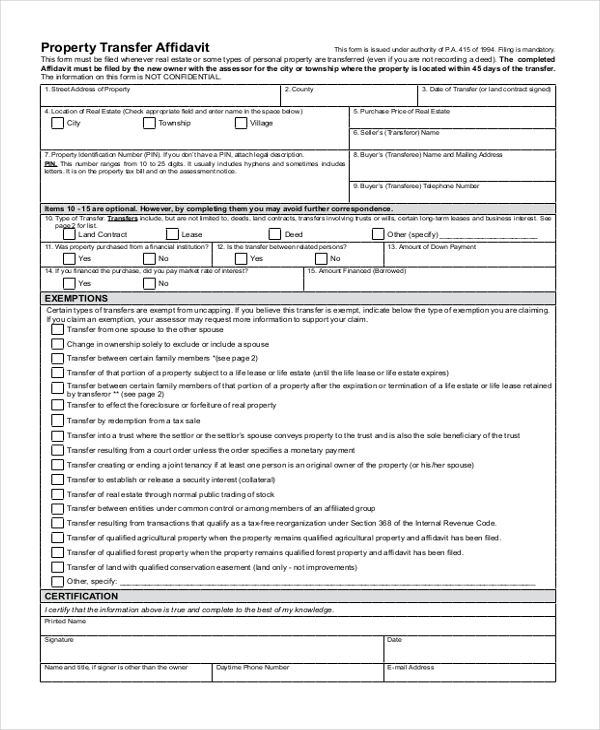 And yes, motor vehicle departments would need these forms as well. What is Covered in General Affidavit Forms? The general affidavit forms include sworn statements taken by the witness of a notary and these statements are legally enforceable. It includes the applicant’s name, sometimes the contact number as well as the mission or purpose of the affidavit. It could be a small estate affidavit form to legally declare a property as “small estate” or an affidavit form concerning the transfer of assets to the survivor of the deceased. If it’s about a sponsored student, then the name of the sponsor and the amount promised by the sponsor would be noted as well. At the bottom of every such form, there would be a declaration from notary certifying the information provided as true. You can also see General Release Forms. If you need suggestions on how to draft general affidavit forms, the samples mentioned above would be beneficial for you. All these are ready general affidavit forms that are designed to save you the daunting task of DIY affidavit forms. You would just need to download a preferred and then simply customize it as per your specifications. An affidavit is a sworn statement or statements made under oath and under penalty of perjury. The person making the statements in the form is called the affiant. When you sign an affidavits form, you affirm that the statement is made with personal knowledge or according to information and belief.